February 28 marked a further deepening of the political crisis and polarisation in Bolivia, when the national congress, in the middle of a blockade by a section of Bolivia’s main social movements, approved a law to hold two national referendums on May 4. One of the votes will be on whether or not to approve the proposed text for a new constitution, drafted by an elected constituent assembly. The other is a constitutional amendment that would limit large land holdings and allow a radical land reform. Expectations are that the tension will continue throughout the whole year. Classifying the government of left-wing indigenous President Evo Morales as “totalitarian” and “anti-democratic”, the opposition announced its scorn for the executive as they continue to push forward plans to hold autonomy referendums in the so-called half moon (made up of the opposition-controlled departments [states] of Santa Cruz, Tarija, Beni and Pando). The opposition claims that the protests by the social movements that have surrounded parliament, and the fact that some parliamentarians were impeded from participating in the parliamentary session that voted on holding the referendums, signified an “abuse of democracy”. The parliament also approved a law of interpretation regarding a paragraph in the law on referendum, leaving the ability to initiate departmental consultations exclusively in the hands of congress. The issue of autonomy is included in the new constitution. Nevertheless, for the government, the autonomy statutes proposed by the resource-rich half moon are illegal. As a response to the strategy of the government, the opposition now plans to hold its referendum on autonomy before the national vote on the constitution. At the same time, some students and middle class sectors are preparing actions “in favour of democracy”, including in La Paz, a strong base of support Morales. Sociologist Eduardo Paz Rada, from the Mayor University of San Andres said that due to the rising political tension, the constitutional referendums may not be held. “In order to hold a referendum, certain minimum conditions are needed, which are not present. For example, amongst the different social sectors in Santa Cruz, there are strong battles” between the oligarch-backed right-wing opposition and the mass of impoverished indigenous people and social movements backing the government. “This is intensifying in other regions of the country, including in Potosi and La Paz. Leading up to May 4, the power groups based in the east and the government will attempt to impede the other side consolidating themselves. Whether or not the referendums are held is tied to this struggle”, Rada said. According to Rada, there has been a clear growth of the right and a corresponding weakening of the Movement Towards Socialism (MAS — Morales’s party) since Morales’s election. He argued this is due to the incapacity of MAS to employ social force to impose its project. For Cesar Navarro, a MAS deputy, the deepening of the polarisation is due, above all, to the fact that the opposition is gaining strength at the regional level, and “has been able to gain traction for negative ideas against our government, such as that Evo is a dictator, anti-democratic, fascist, totalitarian, indigenist, etc.”. He explained that this is why the social movements have already initiated campaigns to distribute widely the text of the draft constitution. 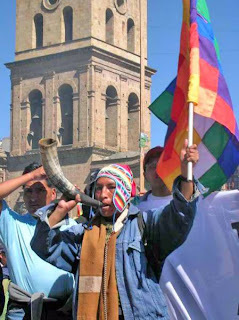 For Navarro, who considers the current political crisis as the most significant since the foundation of the republic of Bolivia, the objective of the opposition sectors is to overthrow the government, through a policy of destabilisation. Faced with the approval of the referendums by congress, the opposition began to denounce the supposed abuse of democracy at the international level. On the other hand, the executive branch denounced at the Council of Human Rights of the United Nations the existence of sectors who are conspiring against the Morales government have separatist aspirations based on wealthy east. It is believed that, if the referendums are held, that while the “yes” vote would win, the “no” vote would win in the half moon departments in the east. This would generate a strong regional polarisation. On February 15, pro-government and opposition forces within congress had begun a discussion over the compatibility of the new constitution with the autonomy statutes launched in the half moon departments in December. Nevertheless, there was little advance in dialogue and on February 26 a blockade of parliament by the social movements was initiated, demanding the approval of the referendums. In this context, according to Navarro, the government decided, together with the movements, to submit the constitutional text to a popular consultation. “More than a decision of imposing something, the option we took was in the sense of providing a new democratic mechanism of consultation … that delegates responsibility of the solution of the crisis to the Bolivian society”, he explained. Rada argued that the approving of the referendums was a strategic move by Morales. “The autonomy referendums were positioned as the central and most important issue and, moreover, were advancing very rapidly, without the existence of a counter position on behalf of the government. Therefore, there was an attempt by the executive of equilibrating the initiative of sectors of the half moon. “It was essential for MAS to take decisive action so that the issue of the constitution could position itself above, or at least, at the same level as that of the autonomy statutes”, he analysed.